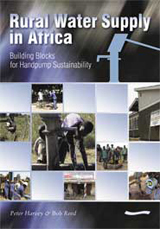 Rural water supplies in sub-Saharan Africa, particularly those relying on handpumps, often demonstrate low levels of sustainability. This book is designed to assist those responsible for planning, implementing and supporting rural water supply programmes to increase sustainability. Its primary aims are to raise awareness of issues that affect sustainability and the interrelationship between them, provide options for addressing these using examples, and describe how these options can be implemented. The importance of a programmatic approach to the delivery of rural water services is emphasized, as is the need for ongoing institutional support for community management and consideration of alternative management models. The book does not prescribe a 'one size fits all' solution but encourages a flexible, holistic approach to decision-making to achieve sustainable outcomes.